Farmers have been protesting in France for several days, blocking roads to towns and tourist sites. They are dumping waste and manure in front of supermarkets, which they say are keeping meet and milk prices artificially low. Dozens of tractors operated by dairy, beef and pork farmers, who accuse big supermarkets of keeping the prices low, have blocked roads to the towns of Caen and Evreux in Normandy. 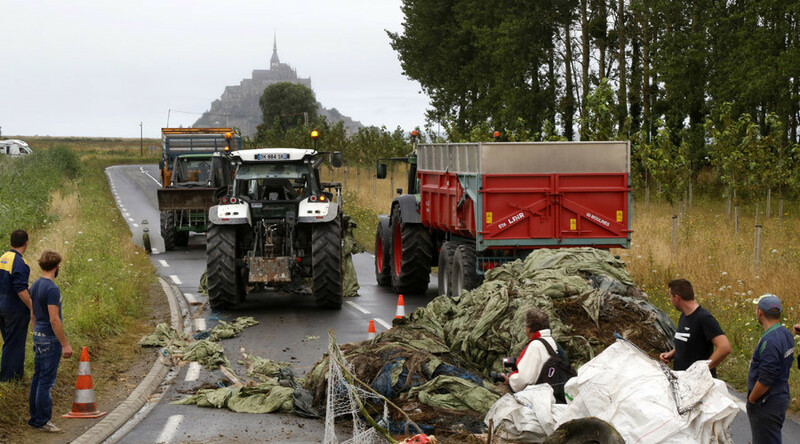 The farmers also dumped manure outside supermarkets in Brest in Brittany. "Many farmers are suffering a great deal. We have never known a crisis like this and we don't see a solution,” pig farmer Jean-Michel Juhel from Pledeliac, in the Brittany region, told AFP. He added that he works 14 hours a day, but loses 30 euros (S$45) from each pig he sells. "Maybe I can last another year. But my wife asks me: 'What are we going to do if it continues like this?'" he added. The protests broke out on Sunday after the farmers hit the streets of the Normandy and Calvados regions and dumped earth and manure in front of local businesses, including a meat-processing plant they consider to be part of their problems. The protesters were holding banners "Angry farmers" and "You’re letting us die." "We have been trying to make the authorities aware of the farm crisis for several months. We clearly have not been heard," Sebastien Debieu, head of the local FDSEA farm union, told BFM TV. Farmers have also held rallies in Montignac in Aquitaine, southwestern France. President Francois Hollande said an emergency plan for the farmers’ situation will be presented on Wednesday at a cabinet meeting. "The situation of farmers and milk producers is very difficult. That is why I have called on distributors to take responsibility. They must stick to their commitments," he said. French retailers agreed on raising prices for meat and dairy products a month ago, in a move that was meant to help farmers. The measure hasn’t helped. Retailers explained the reason might be that they aren’t buying meat from farmers directly, but from processors. Agricultural Minister Stéphane Le Foll said about 10 percent of livestock producers in France are on the brink of bankruptcy, Reuters reported. The minister described the situation as an “agricultural crisis” and told the France 2 channel he would meet farmers in Caen on Tuesday.